© Mrs Family of 5 and The Family of 5, 2011 on-wards. Unauthorized use and/or duplication of this material without express and written permission from this blog’s author and/or owner is strictly prohibited. Excerpts and links may be used, provided that full and clear credit is given to Mrs Family of 5 and The Family of 5 with appropriate and specific direction to the original content. 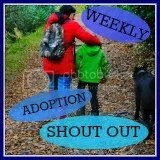 I am the Operations Manager of Barnardos Fostering and Adoption South West. I would very much like to put a link of your blog in our newsletter – can you let me know if that would be ok?